Excellent! 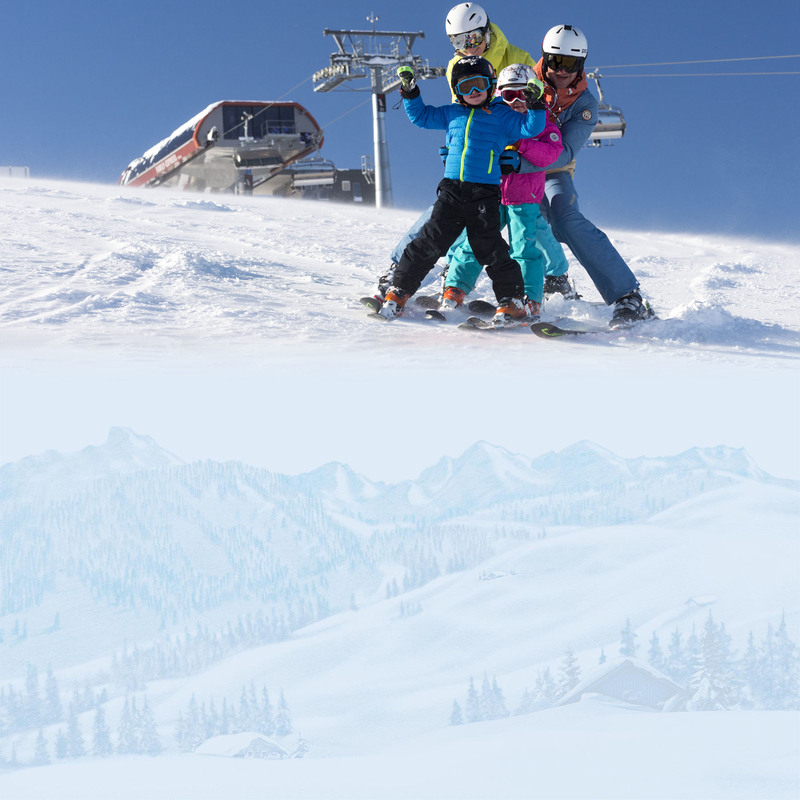 The best ski-area for families! Ski season is finished! Thanks to all our guests! Come and visit us also in summer, season starts on Saturday, May 18, 2019! 12 webcams are looking at Almenwelt! Take a look at Almenwelt. No matter if you enjoy the webcam pictures of middle station, “Family Express” or “Schönbichl” – all of these places are worth looking at! PS: Here you can find all webcams at a look. The pictures are being updated every 15 minutes! Livestream Almenwelt Lofer! Updated every 30 minutes. View into the heart of Almenwelt Lofer with children's world of the ski schools, Almbahn II mountain station, Family Express valley station, in front the new Almen 8er Schwarzeck lift, on the right bottom Restaurant Haus Gertraud und Soderkaser (1.360 m). In the left background you see Grubhörndl lift with freestyle slopes. Schönbühel lift (1628 m)/Almenwelt Lofer. Panarama view of mountain station Schönbühel (1.628 m) northern direction. In the front you see Schönbühel 4-seater chairlift with wide downhill slopes. In the background view overlooking Heutal, Winklmoosalm/Reith im Winkl to the Chiemgauer Alps and Bavarian border. Panorama view overlooking Loferer Alm westwards to mountain station of 6-seater chairlift Family Express and mountain station of 4-seater chairlift Schönbühel (1.628 m). In the background you see the mountain range of Loferer Steinberge. View overlooking children's world of Almenwelt Lofer. To the right "Lofino Kinderland" of ski school Herbst, in the middle you see "Bobo Kinderland" of ski school Sturm. To the left the valley station of Family Express lift and Almenwelt's "magic carpet", 140 m long. Down to the right you see the mountain station of Almbahn II and Restaurant Haus Gertraud in der Sonne. Almenwelt Lofer - valley station. View towards valley station of Almenwelt Lofer (630 m) and the last part of the long valley run (7 km). Panorama view overlooking Loferer Alm southward to the mountain range of Loferer Steinberge and northern Kalkalps. From left you see the peaks of Großes Ochsenhorn 2.511 m, Großes Reifhorn 2.488 m, Breithorn 2.413 m, Hinter- or Mitterhorn 2.504 m. Top right you see Schönbühel lift mountain station and radio tower (1.628 m). View westwards overlooking Almenwelt Lofer - see in front the 8er Schwarzeck lift and mountain station Family Express (1.530 m). In the back you see the 4-seater chairlift Schönbühel (1.628 m), surrounded by the mountain range of Loferer Steinberge. On the bottom left you see Restaurant Soderkaser and Haus Gertraud, right of it Restaurant Soderkaser. 4km cross country skiing and hiking trails. Panorama view overlooking Loferer Alm (1400 m) up to the cross country ski tracks and the new roundabout hiking trails (4 km). Cross country skiing on top of Almenwelt Lofer - skating and classic tracks. This cross country ski trail is the highest in Saalachtal (1.380 - 1.530 m) with magnificent panarama views. On the bottom right you can see the new bar "Kuhbar". Panarama view from Almenwelt Lofer (1400 m) overlooking the Loferer Alm to Grubhörndl, the highest peak of Loferer Alm, offering a magnificent 360 degree panarama view to freestyle slopes left and right of Grubhörndl lift until Family Express valley station. To the left of Grubhörndl you can see the peak of Gföllhörndl. View westward overlooking Loferer Alm to the mountainstation of the popular Family Express (1.530 m) lift. Family Express is a comfortable 6 seater chairlift with bubbles and seat heating, providing a wide family downhill slope. To the right you can see the Lofi-Funline. Panoramaview from Almenwelt Lofer (1400m) direction east to mountain range of Reiter Steinberge and Berchtesgadener Alps, starting left with Reiter Steinberge, Wagendrischlhorn 2252 m, Stadelhorn 2286 m, Hocheisspitze 2521 and Kammerlinghorn 2484 in National Park Berchtesgaden in Oberbayern. In the background you can see the peak Watzmann. Panorama view from the mountain station of the new Almbahn I (1000m) - a modern 8 seater cable car - to the Salzburger Saalachtal with the villages of Lofer (front) and St. Martin (back). In the background you can see the mountain range of the Leoganger Steinberge. Do you search for accomodations for your dream holidays?